The summer of 2013 had me jumping back behind my sewing machine. When Sharky's aunt came to visit from Idaho at the beginning of the summer we had to make a stop at the local quilt shops. 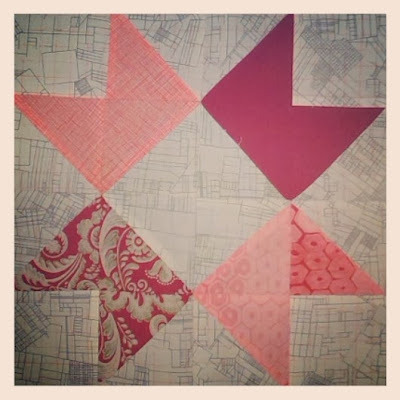 We went to Heartfelt Quilting as our first stop. This store is special to me. Not only is it the close, but it is the first store/business that I set foot in when I moved to Florida from Michigan to start my teaching career. I always think of kindness and warmth quilts and quilt stores alike, and Heartfelt was just what I needed to help me feel at home. I digress. During this visit is when I first heard about local fabric designer, Carolyn Friedlander and her Architextures line of fabrics from Robert Kaufman. 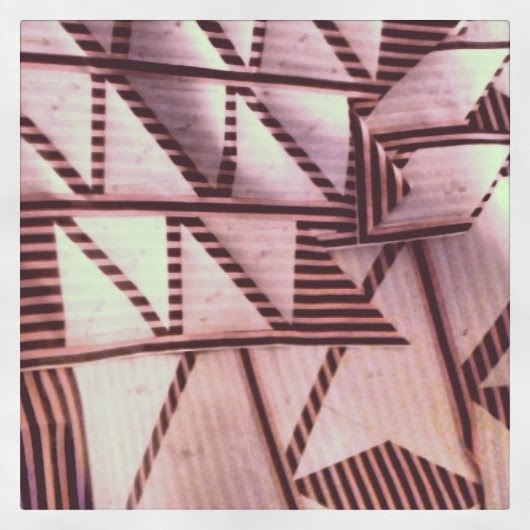 The fabrics were very appealing to me, they stood out from the other patterns that filled the shop. I had to have some. My wallet is glad that I didn't follow the fabric shopping rule that Sharky's aunt holds to, "If you don't know what you are going to make with it, then you should buy at least 3 yards." Needless to say, I didn't know what I wanted to make, but I knew I had to have some of this awesome fabric! I was able to keep myself to 1 yard and 1/2 yard cuts. After the visit with aunt I was left with the guilt of buying fabric with nothing to make. I began perusing the blogs and other online forums for ideas. 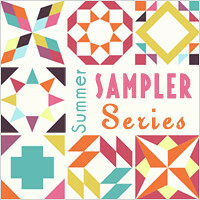 Then I stumbled upon the Summer Sampler Series at Fresh Lemon Quilts. 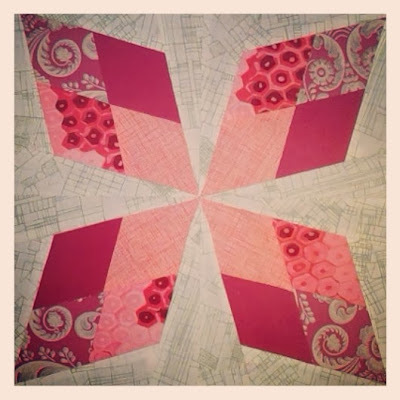 I followed along with the talented hostesses of this project and learned about paper piecing as well as practicing other piecing skills. Katie, Faith, and Lee had very easy to follow patterns. It almost felt like they were right there explaining how to make each block. I realized that I wanted to make a bigger project, but didn't want to repeat any blocks. 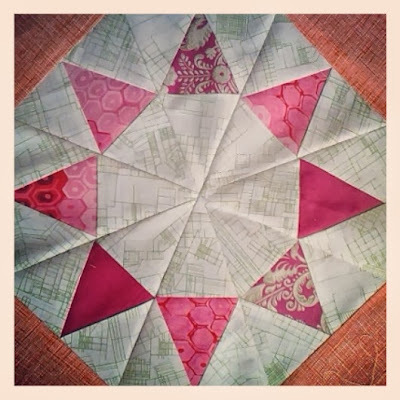 Luckily, Faith also hosted the Solstice Stars Series with equally delightful tutorials for even more exquisite blocks. 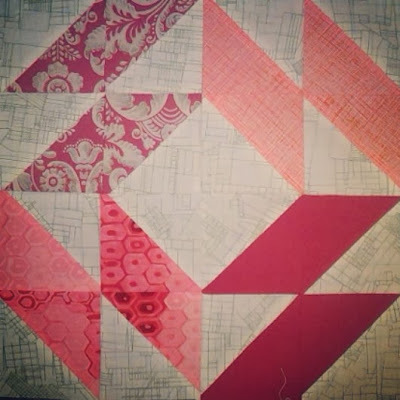 The blocks below come from these two quilt alongs. My $30 thrift shop sewing machine. It's not the newest, most high-tech, but it's still nice. Maybe someday I'll have a really great machine! Have you ever followed a blogger's quilt along? How did you feel about learning through blogs and tutorials? Quilting Among the Groves has been on my mind ever since my first post. 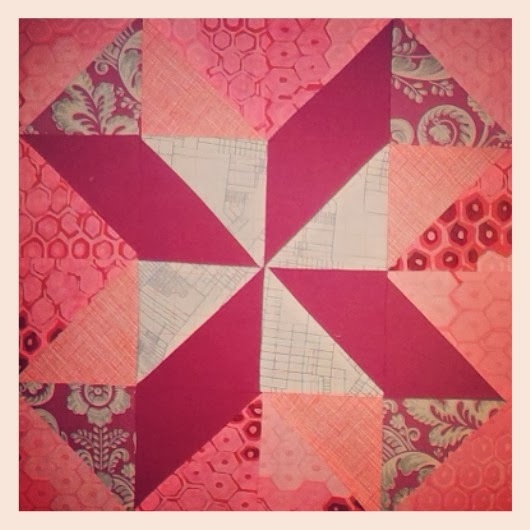 I feel as if I have a strong connection to quilts, but what am I going to write about? 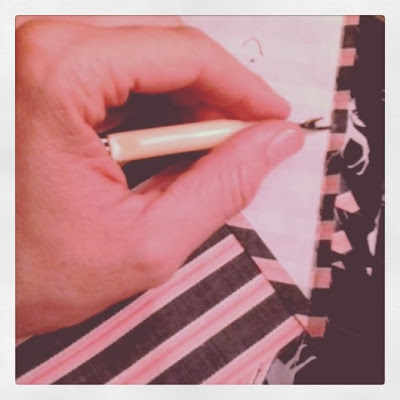 I decided I would start out with a simple list of projects that I am working on, and make these my goals. I will update about how these projects are coming along and keep a record of the new projects that creep in before these get finished. Goal #1. 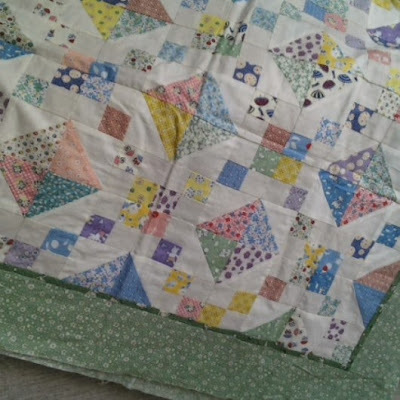 There is this quilt top that I started over the summer. 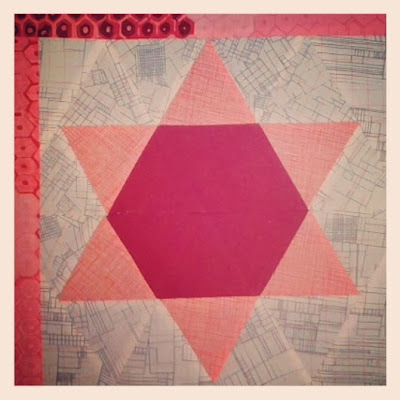 I followed along with some incredible and inspiring ladies; Faith at Fresh Lemon Quilts, Katie at Swim, Bike, Quilt, and Lee at Freshly Pieced. Piecing the top was a fun adventure, and my gateway back into making quilts. 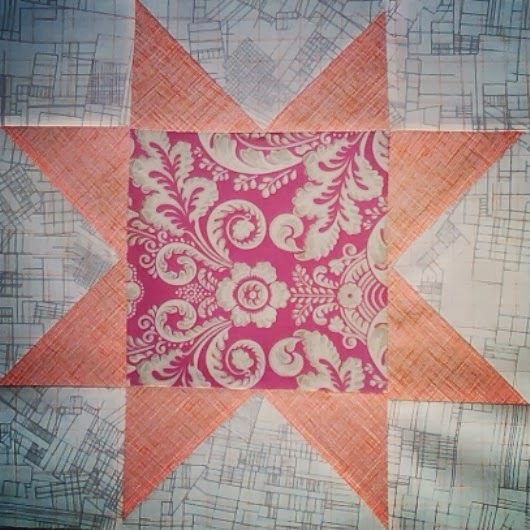 I am currently hand quilting for the first time. I'm finding it to be very relaxing. While it does take time, I am not rushing through it because it is a peaceful process that will be completed in good time. This is a test that I made of my idea from some old shirt material. Here are my pieces cut from freezer paper and ironed to the stripey fabric that I've had for so long. 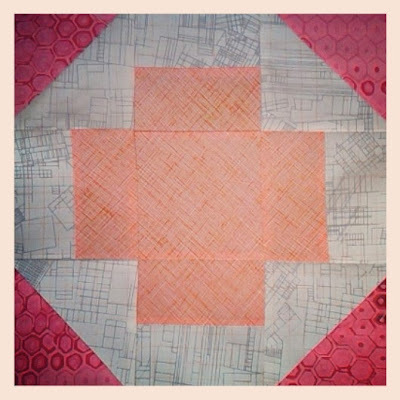 Next, I stumbled across as group of male quilters called Men Who Quilt that I read about on Molli Sparkles blog. I've been reading tons of other blogs and have lots of inspiration, but it did feel nice to find that there is a group of other men who are making such wonderful things! This leads me to Goal #2. 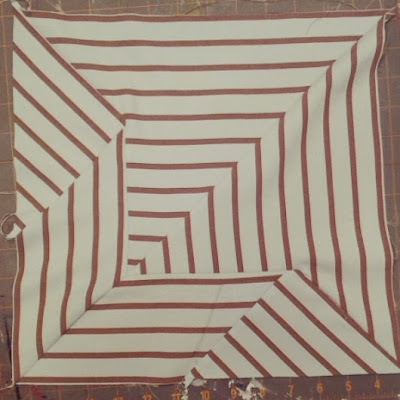 I have had this striped fabric for almost 10 years, but didn't know what to do with it. I have contemplated so many ideas but could never decide. After seeing all of the spectacular creations of the guys from the Men Who Quilt group I decided I too could create figure this fabric out, and just kind of play with the ideas in a more tangible form. 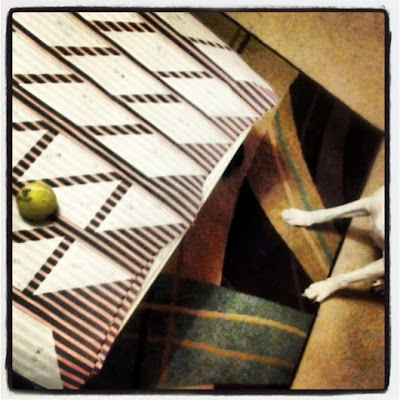 My dog, Barni, would much rather I be playing ball. I had to restart some of my seams because the stripes were not in the correct places. 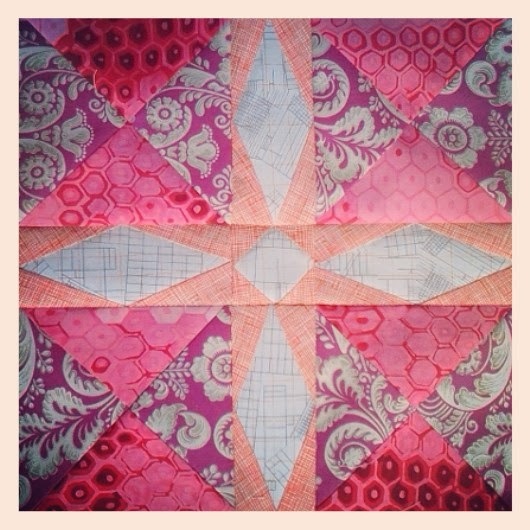 A sneak-peak at my first block for WERQ Bee. There were some members of the Men Who Quilt group who really wanted to participate in an online bee. (A really nice article about Quilting Bees can be found here.) This has become Goal #3. 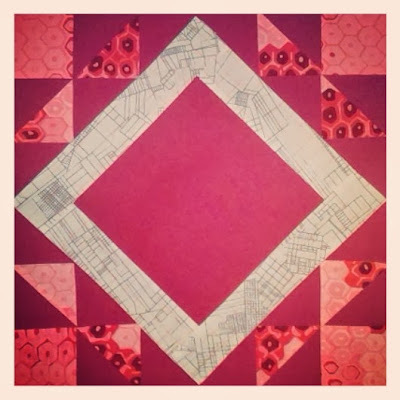 I joined the WERQ bee to learn some new skills, build some quilt blocks, meet some other quilters, and to just see how much I can learn and grow as a quilter. I will be making different blocks each month for this bee. 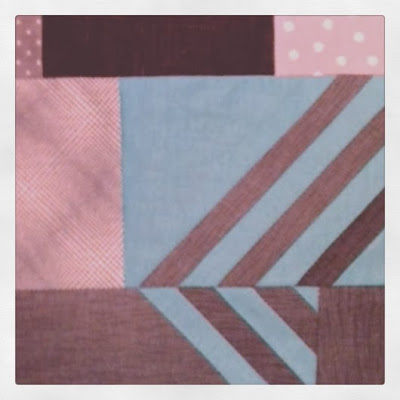 The grey and turquoise block is a close-up sneak preview of the first block. We've agreed not to reveal the finished blocks until the leader bee has received them. 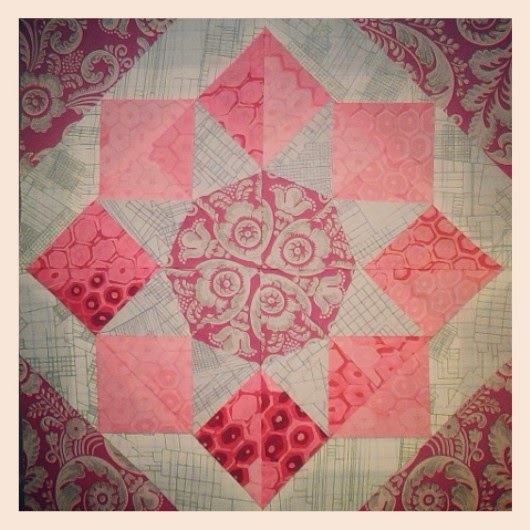 Finally for Goal #4 I want to continue to learn as a quilter while maintaining creative tenacity in my career as an elementary art teacher. 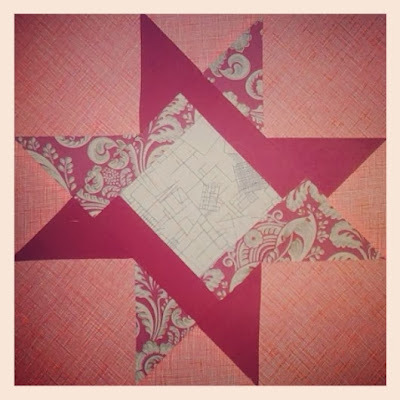 An activity from Generation Q quilts was brought up in discussion at the Men Who Quilt forum to help create different ideas for quilt blocks. 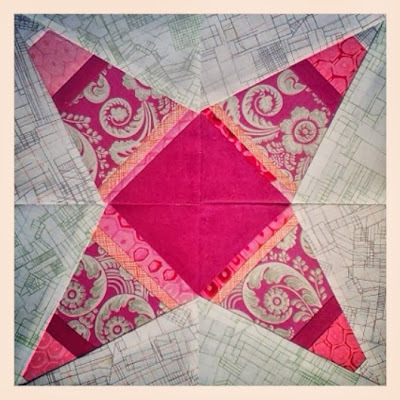 Essentially, you download a template that has an unfinished quilt block repeated six times on the page. The unfinished block is a square that has a few pre-drawn lines. 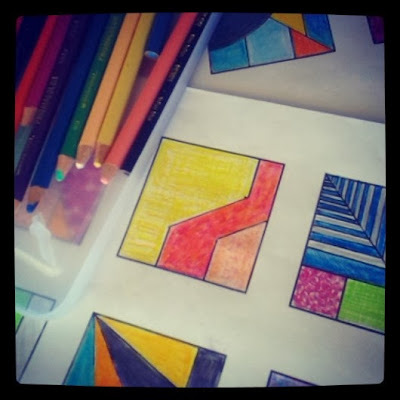 You complete the blocks by adding any additional lines and then coloring them in. It's a great way to play with design ideas and to generate multiple ideas. Creating different solutions to the same design problem is one of the concepts that I am really trying to get my students to understand. I can't wait to take this template to school and let the kids play a little. My designs for the Generation Q Block Builder activity. I hope I haven't bored anyone with my ramblings. I'm just trying to make sense of all the quilty things I'm jumping into and hope this list helps me stay focused. Hello. Welcome to the Groves. I am writing this blog to share my adventures in quilting. 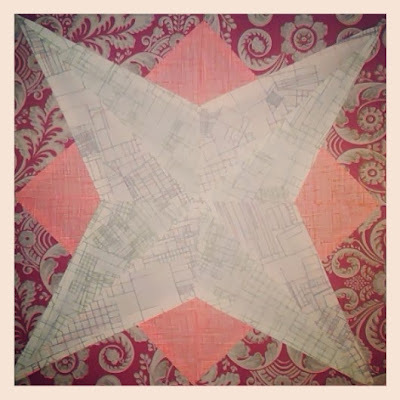 Quilts have been a part of my life for as long as I can remember. My grandmother was a quilt maker and both she and my mom taught me to sew and cultivated my interest in quilts. I am amazed by how many memories have flooded my mind as I write this. 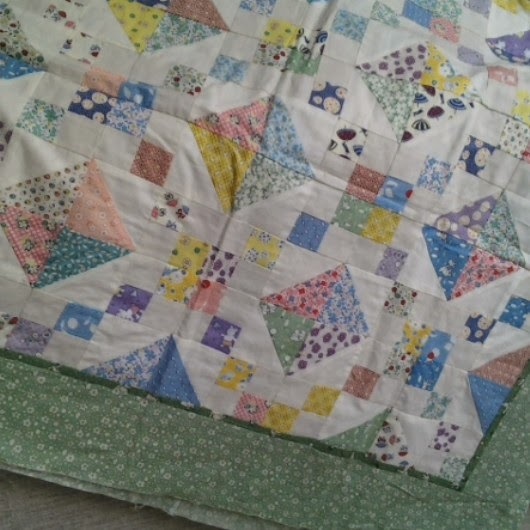 My grandmother made two quilts for me. 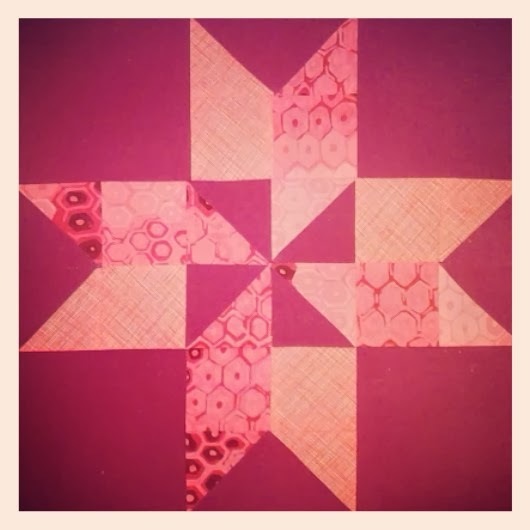 My favorite was made of simple squares of fabric. It was wonderful! I always thought it had a unique ability to keep me warm but still be cool to the touch. I adored it. I loved the colors and looking at all of the patterns in the fabric. 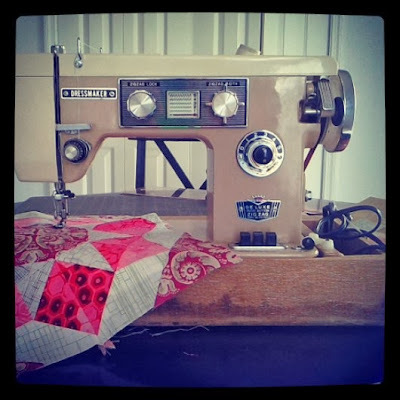 Grandma had a great sewing room and I was always curious about it and all of the amazing things that she did in that room. She pieced quilts, made pillows, and was the go to person to mend torn jeans. I remember my cousin making a special heart shaped pillow with grandma as a guide. I was envious, and wanted to learn too. 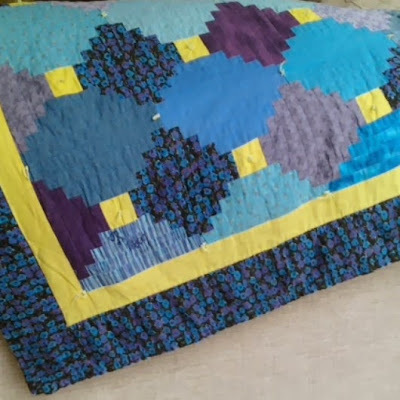 After much persistence grandma helped me piece together two nine patches of corduroy and make it into a pillow. 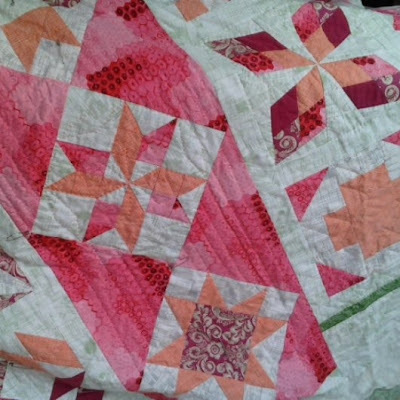 While I have a rich personal history with quilts I am still relatively new to the world of quilt making and hope to learn and grow as an artist and craftsman. I will post here as I am creating and learning and use this as a place for some reflection and nostalgia.